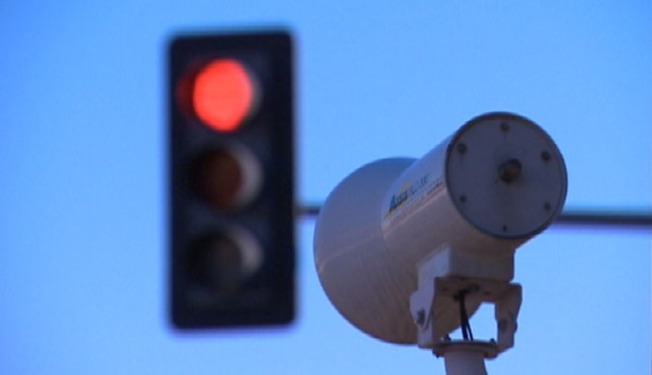 One South Jersey red light camera logged more traffic citations than any other in the state. The red light camera at Route 70 eastbound and Springdale Road in Cherry Hill, N.J. was responsible for 11,890 citations from January through the end of October, according to incident reports from the camera's operators obtained by The Star-Ledger of N.J. The camera, which sits on the very busy highway next to the Cherry Hill campus of Camden County College, captures violators who roll eastbound through the intersection, as well as those who make a right turn on red onto Springdale Road. That one camera captured more than 4,000 additional red light violations than the state's second highest red light running intersection -- Maple Avenue northbound at Morris Avenue in Springfield, Union County, N.J. The Star-Ledger reports 7,713 violations were recorded by the Springfield camera. Another Cherry Hill camera facing the westbound lanes of Route 70 at Springdale Road had the eighth-highest number of red light citations, according to The Star-Ledger, at 6,285 incidents. In all, that one Cherry Hill intersection accounted for 18,175 red light citations. At $85 each, that intersection could make the municipality $1.5 million. The cameras have been controversial in the Garden State. A $4.2 million class-action settlement was handed out to nearly half a million drivers after cameras in 18 towns were not regularly inspected, among other issues. The program has 76 cameras across the state -- nine of which are in South Jersey. The cameras were installed in 2009 as part of a pilot program. That pilot period is set to end by Dec. 2014.